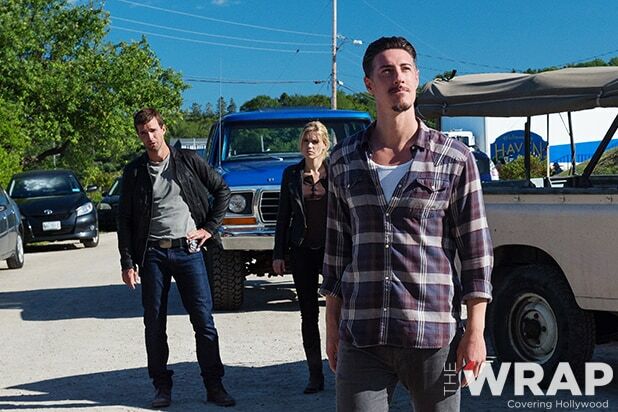 Emily Rose, Lucas Bryant, Eric Balfour and Adam Copeland star on the drama based on Stephen King‘s short story “The Colorado Kid.” It’s set in a small coastal Maine town where everyday citizens are stricken with “Troubles,” supernatural powers they cannot control. Below, Stanton talks about going into Season 5 of the show as if it were its last, whether there might be a movie to wrap everything up, or even if the show might find a new lease on life elsewhere. Did you guys go into this season as if it were the last? We are looking at our final episodes coming up. We approached as if it was going to be our final season, so we were ready for it story-wise. But you never know. If a million people watch, maybe we can do something about that… But we had an idea that it might be [the final season]. I’m sure as a fellow TV fan, there’s nothing more annoying than when a show kind of feels like it might be wrapping up, but they just don’t address it, they don’t come to any kind of satisfying conclusion. I always think that’s cheating the audience a little bit, of a nice satisfying ending. So we really looked at these 13 episodes as if… If we were indeed going to end, what would be the best ending we could possibly do for Haven? So the final episode, was it written as a series finale? We left it open but if it is the series finale, we think the fans will be satisfied. We didn’t want to leave it on a giant cliffhanger, just in case we didn’t come back. We didn’t want to leave fans going, “Wait a minute!” because I’ve seen shows do that, and as a viewer, it’s just so frustrating. So as a writer it was kind of nice to say, ok, if this is the end, how can we leave this world in the most satisfying way possible? Is there any possibility of going back to reshoot the finale as a series finale, or maybe a two-hour movie to wrap everything up? I think it will feel satisfying on its own as a finale for a series as a whole. But if fans wanted a TV movie after that, I bet you’d find some actors and writers who are very amenable to that. Sam Ernst and Jim Dunn, who created the show, have talked about knowing what the ending of “Haven” looks like. Is that the ending we will be seeing? That’s an interesting question. I think parts of it are. Haven evolved so organically over the years, things happened that creators couldn’t really anticipate, so I think some of the stuff is new. We definitely did some stuff that they saw from the very beginning in terms of thematic closure and relationship closure and stuff like that, but as our mythology expanded over the years, I think we ended up taking it to maybe a deeper level than we would have thought we were going to in the pilot. What about the possibility of the show going to another network or a streaming service like Netflix? I’m sure that [the show’s production companies] eOne and Piller/Segan/Shepard are out there looking at that option, which is out there now. It’s so cool, that that option now exists where it never used to. I can’t speak to it personally because I’m not involved in those discussions. But you guys would be interested in continuing the story if that were to happen? Oh I think so, absolutely. It’s such a rich world. Sam and Jim created this whole universe that I think you could do it for years and years and years. it’s just such a great canvas that you can lay any characters you want over it. You can never run out of Troubles! Stay tuned for more of TheWrap’s interview with Stanton fellow “Haven” showrunner Matt McGuiness. “Haven” premieres Thursday, Oct. 8 at 10 p.m. ET on Syfy. In Canada, the show returns Sunday, Oct. 11 at 7 p.m. ET and 10 p.m. PT on Showcase. The show will also premiere new episodes on Syfy channels in 87 countries around the world – with the UK, Germany, Spain, Asia and Benelux among the countries expressing the roll-out of new episodes in primetime, immediately after the U.S.